Even though I live right outside Washington DC, it’s unusual for me to read books set here. Even movies and TV shows set in this area seem ignorant of the fact that the city is more than the monuments, the Mall, the White House, and the Capitol building. So I was delighted to realize that Thomas Mullen’s The Revisionists is set in DC and makes use of many different parts of the city and surrounding area. The opening scene took place near my own home, a character went shopping at the Whole Foods that I sometimes visit after going to the theatre, and two characters had dinner at an unnamed restaurant that had to be Jaleo, one of my favorites. It’s a silly thing to enjoy in a book, but I have to admit that I did enjoy it! 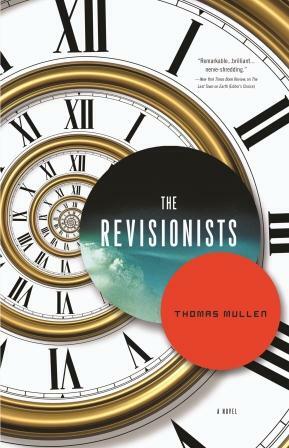 The Revisionists is set sometime in the present day or near future (sort of—more on that later), and time traveler Zed has come from the distant future—a time he knows as the “Perfect Present.” His duty is to protect the Perfect Present by ensuring that history unfolds as it must in order for that present to occur. His adversaries are the “hags,” time travelers who wish to prevent past tragedies, regardless of what it might mean to the future. Zed’s current assignment is to ensure that a cataclysmic event known as the Great Conflagration actually does occur. The novel alternates between Zed’s first-person narrative and the third-person storylines of Tasha, an African-American attorney for a law firm involved in some shady business dealings; Leo, a former government agent in Indonesia now using his spycraft as an employee of an independent contractor; and Sari, an Indonesian woman employed by a South Korean diplomat. The book straddles the line between science fiction and political thriller. Tasha, Leo, and Sari are caught up in scandals and controversies that are very much of our time. I don’t believe we’re ever given a year of when the story takes place, but it feels like the present day, or the very recent past. In fact, given news headlines in recent weeks—the withdrawal of U.S. troops from Iraq and the death of Kim Jong-Il—I wonder if this book will start to feel prematurely dated. The book’s present day or near future is already the past. However, the questions raised in the more speculative sections—What price are we willing to pay for safety? What control are willing to give the government? What is the role of history? Is there such a thing as a perfect time and place?—are relevant in any era, and the book raises these questions in clever and interesting ways. There’s a lot of story here, and Mullen is generally adept at juggling the various pieces. For most of the book, the pace was fast enough to keep my interest, but after a slow patch toward the middle, the ending moved too quickly. When the different storylines merged, the narrative became confusing. There were too many agency names and conspiracies and whatnot being tossed around. I’m terrible at untangling these sorts of storylines, so others might find it less murky than I did. I decided to not sweat the details and just focus on the people and where they ended up. The resolution of one storyline in particular was wonderfully ambiguous. In fact, I would have liked Mullen to spend a little more time on the implications of this particular revelation because it colors so much of the way the novel as a whole works. I wouldn’t want Mullen to ruin the ambiguity by spelling out exactly what happened, but I didn’t feel the character involved spent enough time reflecting on the new, potentially life-changing information and what it might mean. Instead, it was all chases and deadlines and shootings and rescues. When the character does reflect, he reflects on the wrong things, in the wrong way. What was by far the most interesting bit of resolution is just brushed over, when it should have been dwelt on just a little. A missed opportunity that could have made a fun and engaging book into a stunner of a read. 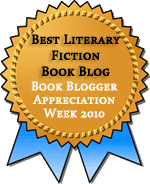 This entry was posted in Fiction, Speculative Fiction and tagged BEA Review Copy. Bookmark the permalink. It hardly ever happens to me. Sometimes with books set in London, but that’s probably partly because I’ve only been there as a tourist and tend to visit places that get mentioned in books. I would expect it to happen a lot with New York. Maybe it’s just a matter of finding the right books? Do you read a lot of books set in New York? I always really enjoy it when books are set in a place I know well- whether its my hometown or the place I went to college, or the city I lived in during art school… and its especially good some details match exactly what my experience was. It hardly ever happens for me. I think all the other places I’ve lived just aren’t fodder for fiction. My hometown was tiny, and most novels set in my college town (Williamsburg) are set hundreds of years ago, so there’s not much to recognize. I love it when familiar places pop up in books. It really helps me to visualize the story, and I just get a kick out of it. It really did make the story extra vivid and extra fun. I love it when DC is used as a setting — I live in downtown DC — and I love it even more when they get it wrong! It amuses me to no end. This one was pretty decent on the details though. I enjoyed the book but the muddled timelines were confusing. I think that was probably intended but I also thought there were too many things left hanging. Even though I accepted there couldn’t be answers, I still wanted them. Ha! I enjoy catching little slips like that as well, and as long as they’re minor, they don’t take away from the book’s quality, IMO. I was impressed with the details here, at least when it comes to the areas I know (some neighborhood I’ve not been to at all). Mullen did live in DC at one time, and I think it shows. And I agree that a lot of the confusion was intentional. I wouldn’t have wanted to know for sure what Zed’s real story was, but I did want the possibilities to be explored more. It seemed like this intriguing possibility was raised and then dropped. Knowing the area where a book is set (and knowing that the author got it right too) always adds an extra layer of enjoyment to a read for me (cf Rivers of London by Ben Aaronovitch which recently wowed me). I very much enjoyed Mullen’s previous novel ‘The many deaths of the Firefly Brothers’ – a 1930s gangster novel with a twist. This one, even if slightly flawed, sounds interesting and I’d love to read it. I was wondering what his others books were like. I’ll look into Firefly Brothers. This one was good fun, despite the rushed ending. I think there’s a good chance you’d enjoy it!